VAN NUYS, Calif., July 23, 2015 -- Today MGA Entertainment (MGAE) is re-launching its iconic fashion doll franchise, Bratz®. After years of hiatus, the brand is back in stores with a new mantra: It's good to be yourself; It's good to be Bratz. 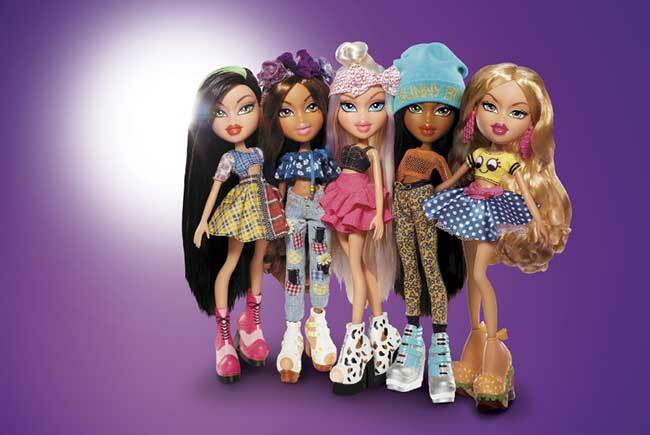 The Bratz brand has always stood for self-expression, individuality, diversity, confidence and creativity. Now the dolls, which have a reinvented look that speaks to a new generation of girls, will also provide ample activities and avenues for girls to create their own worlds, discover and express their true selves. The core Bratz dolls, Cloe, Yasmin, Jade and Sasha, are returning along with the newest member to their group of besties, Raya. Featuring vibrant fashion based on pop culture trends, the brand re-launch will also include revolutionary entertainment content, an immersive digital app, a Bratz emoji pack, and play sets that encourage creative play. Bratz Fierce Fitness showcases Bratz's healthy hobbies in the most fashionable and fun way. Hit the trails with Cloe in her visor, backpack and binoculars or rev up for a race with Jade and her sports bag and hydration bottle. Yasmin is channeling her inner Namaste with a yoga mat and gear. Bratz #SnowKissed celebrates Bratz's love of fun winter activities. Each Bratz comes ready to hit the slopes in stylish snow gear including an apr(bleep)s ski outfit, hot cocoa mug and a sticker sheet to customize their snowboards, sleds or skis. "Bratz have always led the industry in providing a diverse collection of dolls that offer girls a way to play as creatively as possible," said Isaac Larian, CEO of MGA Entertainment. "What makes the new Bratz collection so unique is that we've also included immersive ways for girls to create their own worlds physically and digitally. Bratz is back to arm girls with the confidence to know that it's good to be yourself; and it's good to be a Bratz." To support the global reintroduction, MGAE also worked in collaboration with Stoopid Buddy Stoodios, a production studio specializing in groundbreaking stop-motion animation, to develop hilarious entertainment content. Adweek's 2014 Agency of the Year, Droga 5, helped develop an immersive and entertaining mobile app, launching soon on the iTunes App Store and Google Play. Teen pop star Skylar Stecker recorded an original song, "Bratz What's Up," which will be available on iTunes this Friday. MGAE has also created custom Bratz emojis to reach young fans of the brand where they live; on their mobile devices. Bratz products will be available at Target, Walmart, Toys"R"Us (who will each have an exclusive assortment of products), Kmart, Amazon and all other major retailers. For more information on Bratz, please visit www.bratz.com, www.facebook.com/Bratz, or www.instagram.com/officialbratz. For more information on MGAE, please visit www.mgae.com. MGA Entertainment, a consumer entertainment products company headquartered in Van Nuys, California, manufactures innovative lines of proprietary products for the toy and consumer electronics market. The company licenses its products in such areas as home décor, stationery and sporting goods. The MGA family includes award-winning brands such as Little Tikes®, Lalaloopsy™, Moxie Girlz™, Mooshka™, Bratz®, Vi and Va™, and Zapf Creation®.